For the ultimate Mt. Rainier tour experience, look no further this exclusive helicopter flight and hiking tour combination experience. With 369 square miles of rugged mountainous terrain and Washington's highest peak at it's core, this incredible helicopter flight and ground tour combined together is the only way to see the most of Mt. Rainier in a single day. Your tour includes a 35 minute flight between Seattle's Boeing Field and Mt. Rainier National Park, a flyby of Snoqualmie Falls, a 4 hour hiking and driving tour on the ground through the National Park itself, and gourmet food. This is a boutique experience, and is limited to just up to 6 guests per tour. 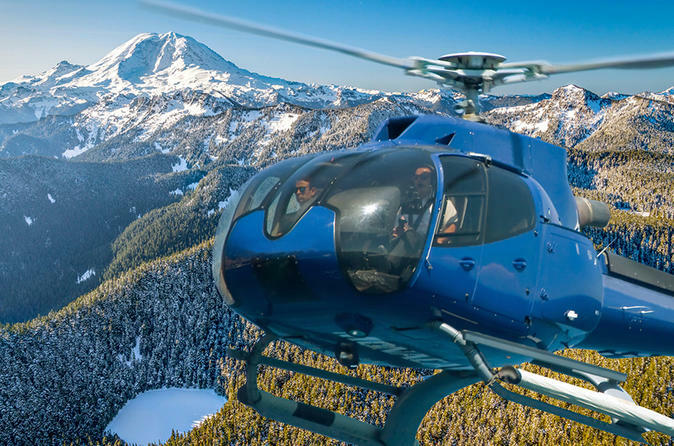 Your full day incredible Mount Rainier helicopter flight and hiking combo tour is divided into three parts: 35+ minute helicopter flight, 4 hour ground tour with naturalist walk, private vehicle transport, and a catered meal. This tour is available for morning or afternoon departure. Both tours include all of the same incredible experiences. You'll learn about the mountain's geologic history, diverse climate and stunning glaciology. On a moderate hike, you'll breath in the freshest mountain air and search for wildlife in the forest and sub-alpine slopes. Stopping frequently to marvel at the scenery around us, countless photography opportunities await you around each bend in the trail. Best of all, you'll share this experience with a tiny group of just up to 2 other guests. The ground tour combines travel on foot and via private vehicle along the Park's roads. We want you to eat well during your full day excursion with us. Your tour with us includes a delicious, beautifully catered meal in the midst of Mt. Rainier's natural splendor. Guests joining our morning tour will enjoy lunch in the Park before departing back to Seattle via helicopter. Guests arriving via helicopter in the afternoon will be treated to a full afternoon tea and canapés before returning to Seattle via private ground transport.